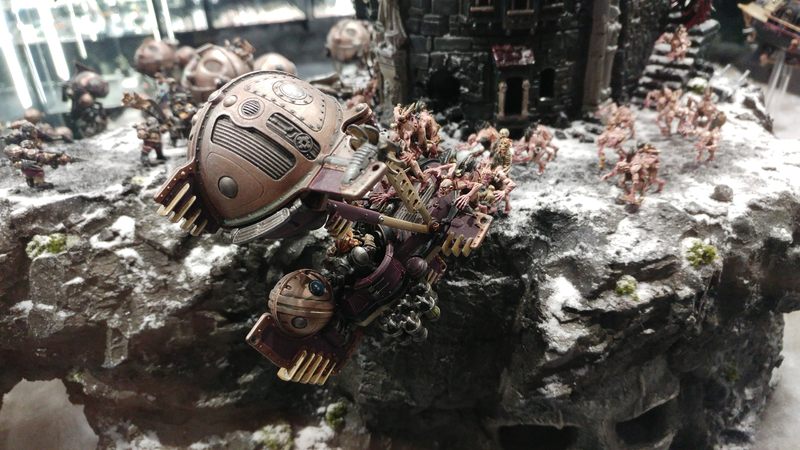 So a bunch of us local gamers made a jolly again down to Warhammer world down in Nottingham. 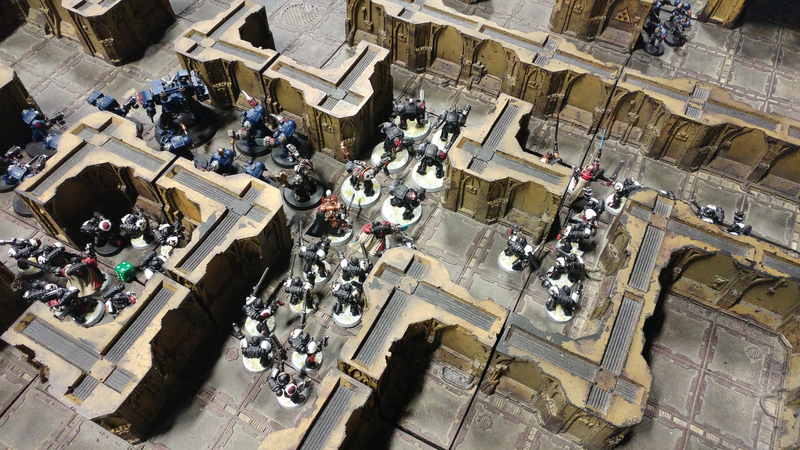 It was the big Games Workshop 40k Campaign event, and so tables were limited. 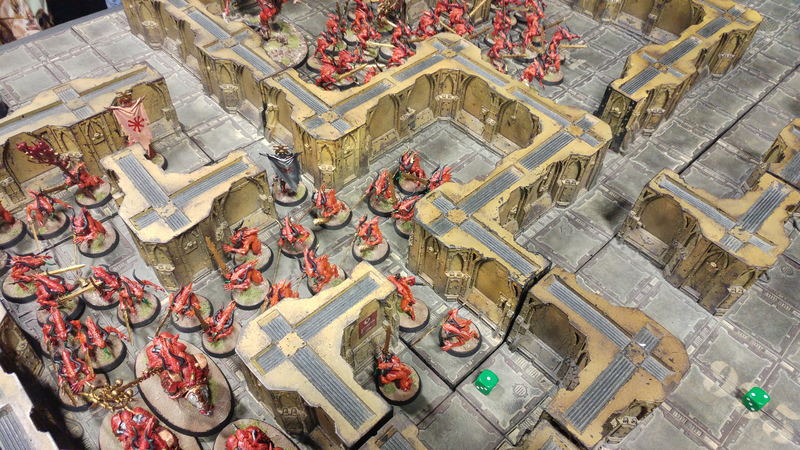 We managed to secure the Zone Mortalis table, which meant corridors! 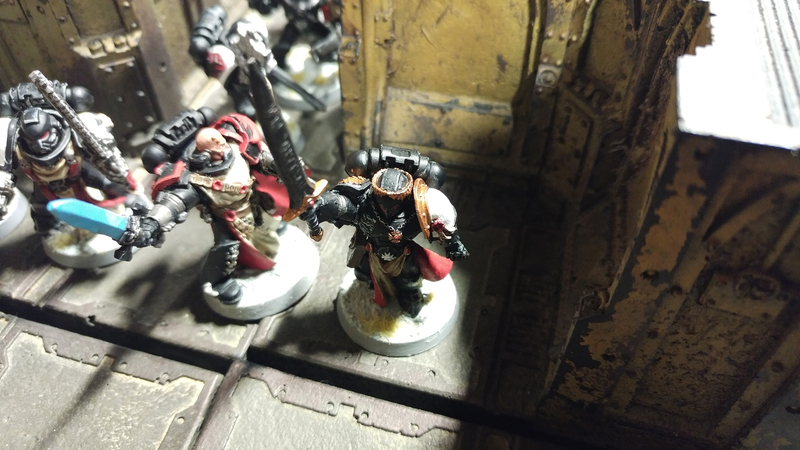 We had myself with Black Templars, a Crimson Fists battle brother, a filthy Tau commander, and a damned Khorne Demons player. We quickly made up a scenario where a joint attack on a Tau carrier by Crimson Fists and Templars caused the Tau to lose their ship and make a break with boarding pods to attack the Marine’s Strike Cruiser. The Strike cruiser attempted to escape into the warp, but the Gellar field failed, causing rifts to open into the warp and allow Khorne’s minions into realspace. 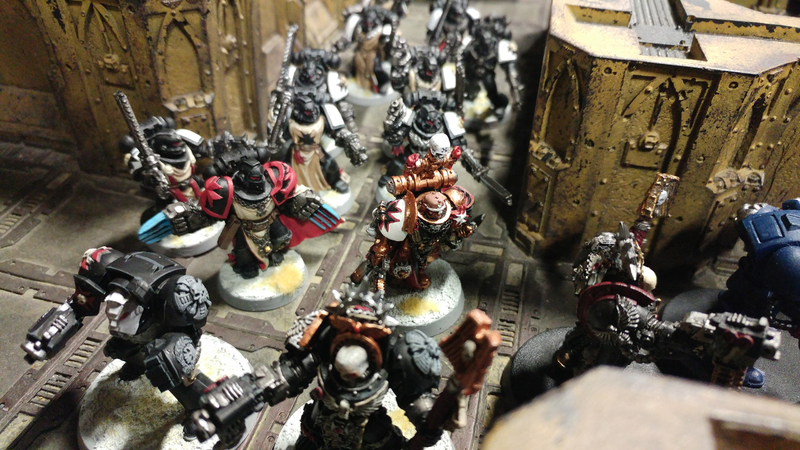 Terminator squad prepares to repel Xenos scum! So with that in place, we set about deploying. Our Tau commander was a little late, so we agreed to let the tide of blood unleash itself onto the board, and play a turn so that there would be space for the Tau boarding party to arrive. Battle brothers of the Crimson fists and Black Templars fight as one! 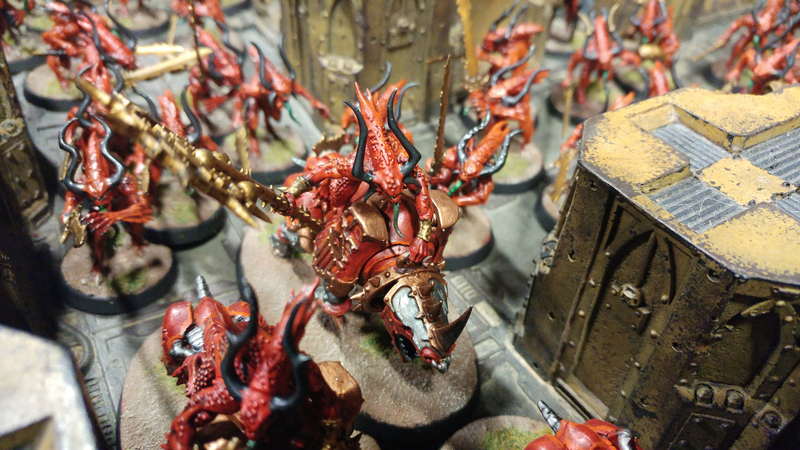 A tide of Khorne demons, including a Bloodthirster and some Bloodcrushers! 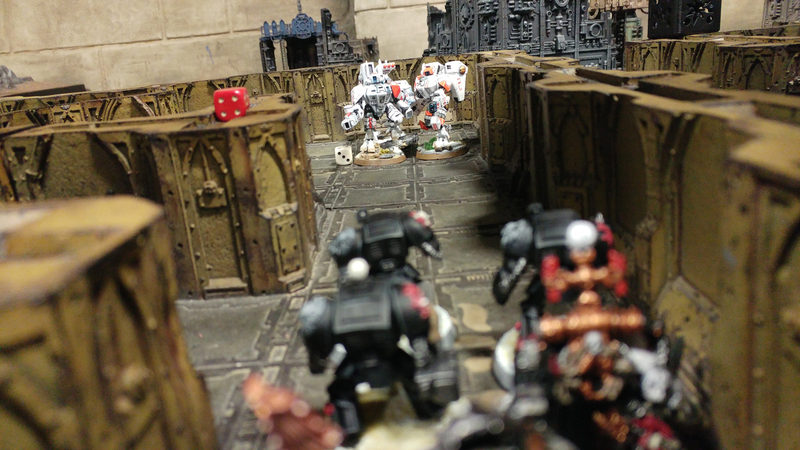 The initial fighting went well for the Space Marines, with lots of fire power stripping the Demons of their grip on reality. In actual fact, dice rolls on our side were really good, and invulnerable saves seemed to matter not! 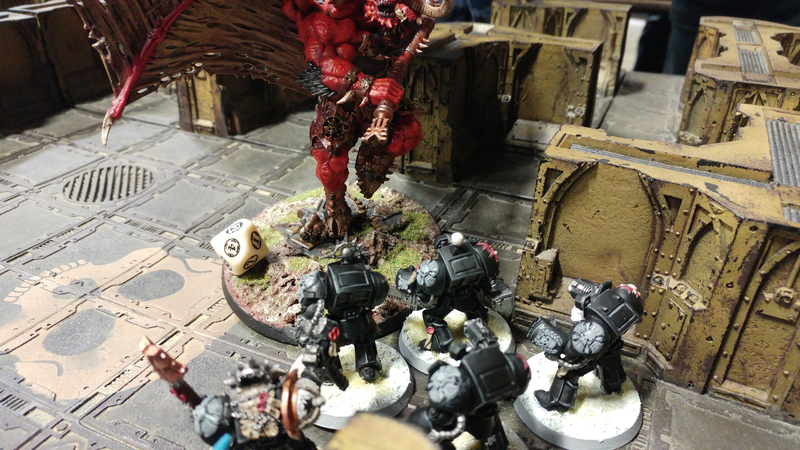 When the Tau commander did arrive, their small boarding party appeared just in time to see the mighty Bloodthirster fall to overwhelming attack from two terminator squads, the Emperor’s Champion and High Marshall Helbrecht. Helbrecht ready for the assault on the Bloodthirster. 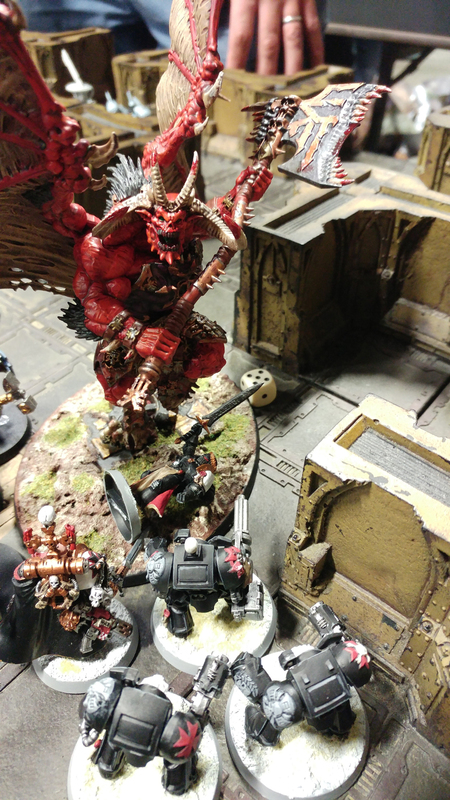 The Emperor’s Champion prepares to sacrifice himself in order to crush the Demonic filth! 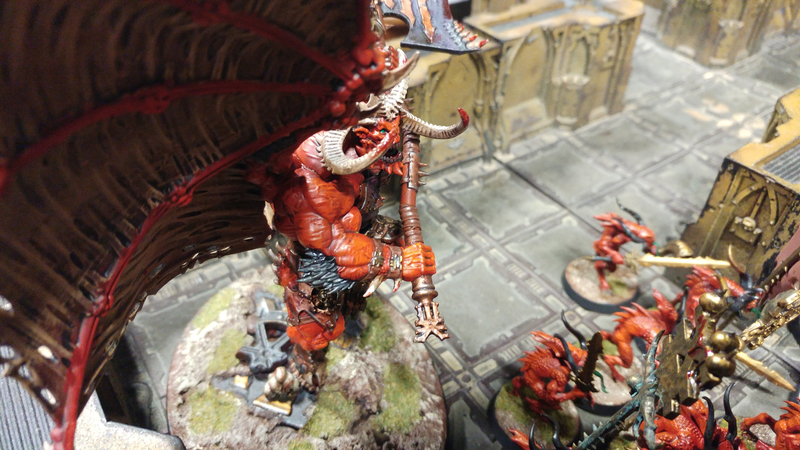 The Emperor’s champion did a whopping 4 wounds from 6 attacks on the Bloodthirster, but was felled in return. In the end it took the combined might of the terminators to bring the foul monstrosity down. In the end, numbers won the day! 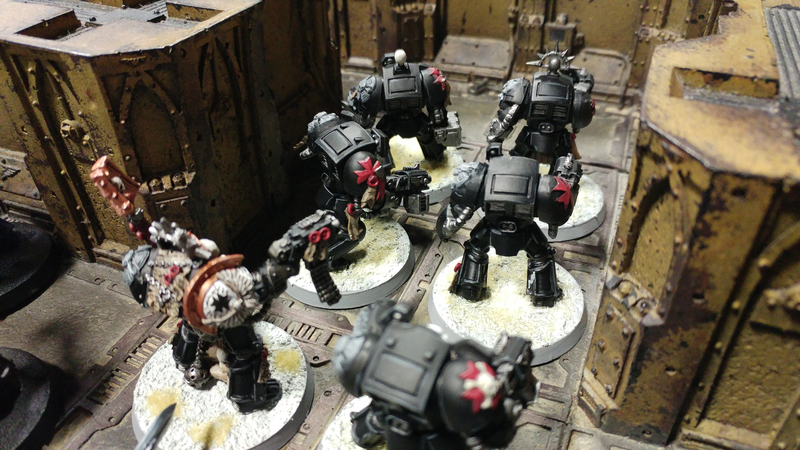 Unfortunately, the arrival of the Tau couldn’t turn the tide, and after their victory against the Bloodthirster, the Terminators where ready for more! Got you in their sights! It was almost a narrow draw in the end. With the last roll of the game to see how many objective points the Tau/Demonic insane alliance got for wiping out some units, they only rolled high enough to lose by 2. Was a fun game, but the board is very restrictive. I feel like it would suit a small kill team free for all though! 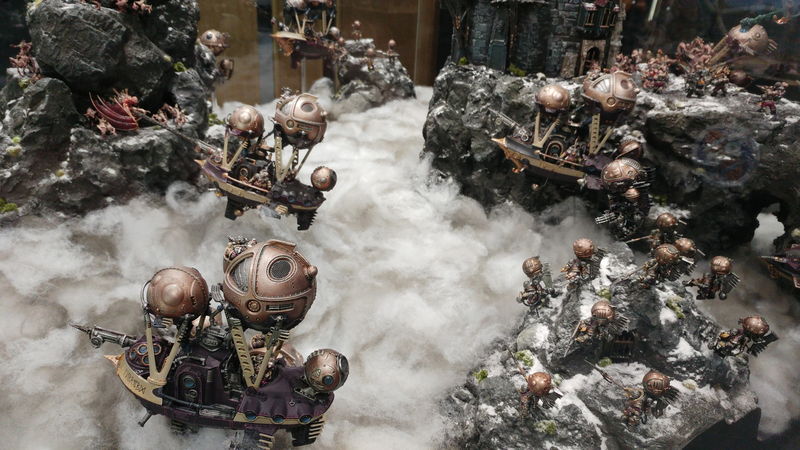 Would like to go back and try again, maybe with an inquisitorial retinue…. ← Prepping for a tournament.